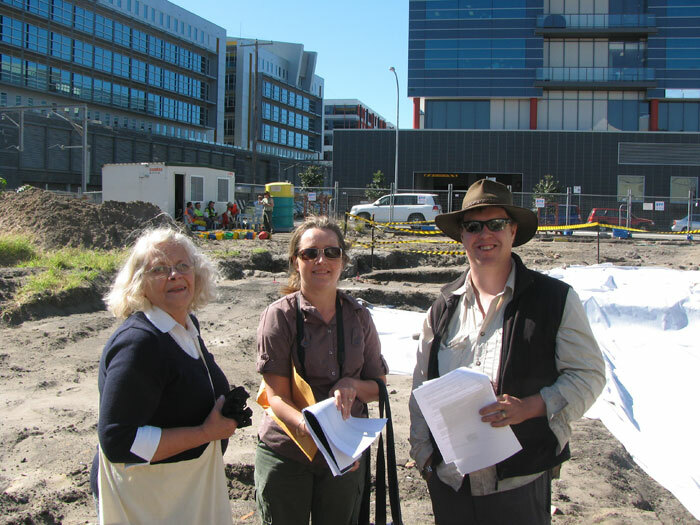 In August 2009 we were very excited about the archaeological excavations being undertaken on the former Palais Royale site in Newcastle West. We are proud to report that the first of two Reports have been released covering the Aboriginal history of the site. Over 5,534 Aboriginal artefacts were recovered, representing three Aboriginal occupation periods dating from 6,716-6,502 years BP (before present) and identified as a site of ‘high to exceptional cultural and scientific significance’. We wish to thank everyone involved with this Project for the production of this wonderful report. We hope it will assist the wider community to fully comprehend the depth of history that lies beneath our feet, and the importance for that history to be understood, respected and safeguarded for future generations. A couple of years ago I was very excited to visit the archaeological dig at at the former Palais. Back in 1825 this was the place (the then ‘Government Farm’) where the Rev. Lancelot Threlkeld spent his first year in Newcastle. Within days of his arrival on 8th May 1825, Threlkeld and his young family had been robbed three times, and fearful of being robbed every night. It was here that he heard the local dreaming stories, would witness healing rituals and a burial, and document numerous atrocities perpetrated against the local Aboriginal people. It was here that he, and one of those natives, Biraban (or McGill), began a collaborative study into the local language, the first methodical study of an Aboriginal language anywhere in this country. So it was thrilling to see a scientific report released this month 186 years after these events. One small rectangular sample trench yielded over 5,500 artefacts, representing three waves of Aboriginal occupations dating from 6,700 years. The archaeologists stopped digging 2 metres down, concluding the deeper they went, the more they would find that dated even further back deep into time. 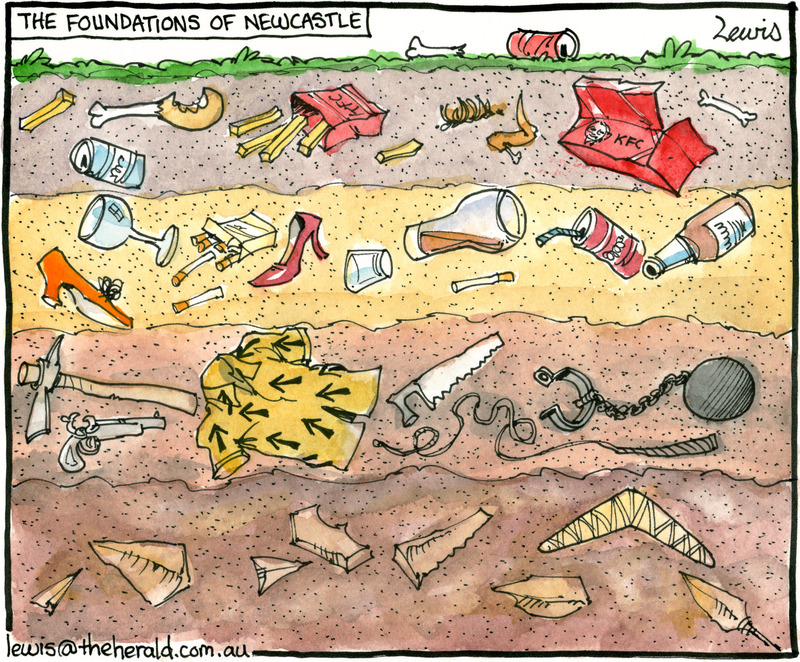 The upper strata of the dig represented the last 1,933 years of Aboriginal occupation that unfortunately had been obliterated by 200 years of European occupation. So why get excited over a pile of stone tools? Firstly we are nothing without history. It documents our achievements and our failures, and enables us to understand who we are, so we can avoid mistakes in future. It is impossible to write history without documentary records, and equally important that it is verified and corroborated by surviving physical evidence. Without documentary and physical evidence you don’t have a case in a court of law, and neither do you have a case for a culture, without evidence all you have are tall stories. As it stands, with regards to developments there is no publically funded archaeological research. 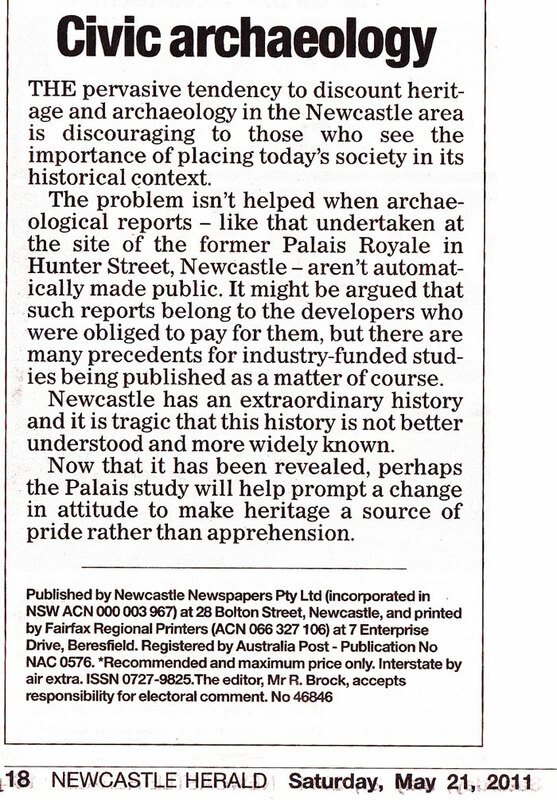 Historians and archaeologists are in the direct employ of the developers who pay for them. They investigate, document archaeological finds, create reports that remain the property of the developer. 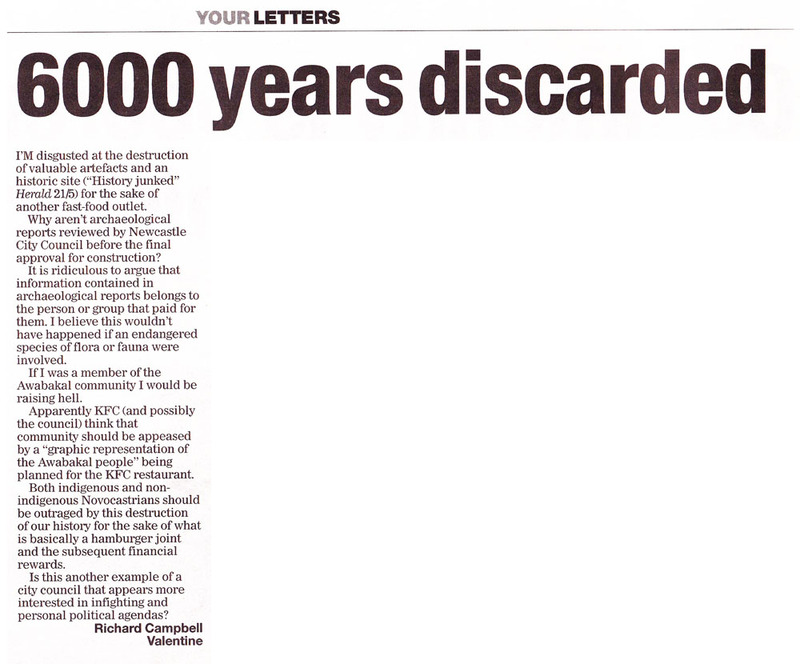 Is it right that our history has been privatised? These reports should be made public, so we can learn more about our history. Without history, our community suffers, and like a patient with dementia we are confused and fearful. There is unfinished business here, and the sooner re-examine our shared memory, the healthier we will be. This Land and its Aboriginal people did not suddenly come into being when a European ‘discovered’ it 1770, and neither did they both become someone else’s possession once pen hit paper on a map and acquired it for the Crown. Threlkeld and his family were welcomed here with a barbeque and a dance, and the tradition would continue right up until the last days of Palais Royale where many people met and later married after dancing at that very spot. We need to ask ourselves how different would we feel if these ‘rocks’ had instead been WW1 relics? It was very fortunate for us, that on the 10 June 2008 such a discovery of rising sun collar badges was made in one of the burial pits during the excavation at Fromelles, in France. The landowner, Madame Marie Paule Demassiet, not only allowed the archaeological dig on her private property, she gifted the land for an ongoing memorial. It was a wonderful gesture to see good-hearted people hold our heritage is such high regard. 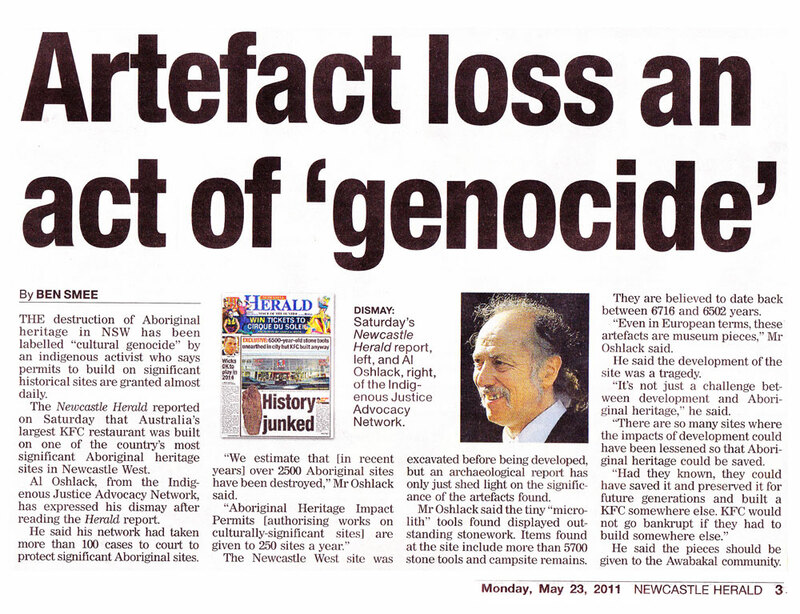 It would be great if we could extend the same respect to Aboriginal people. 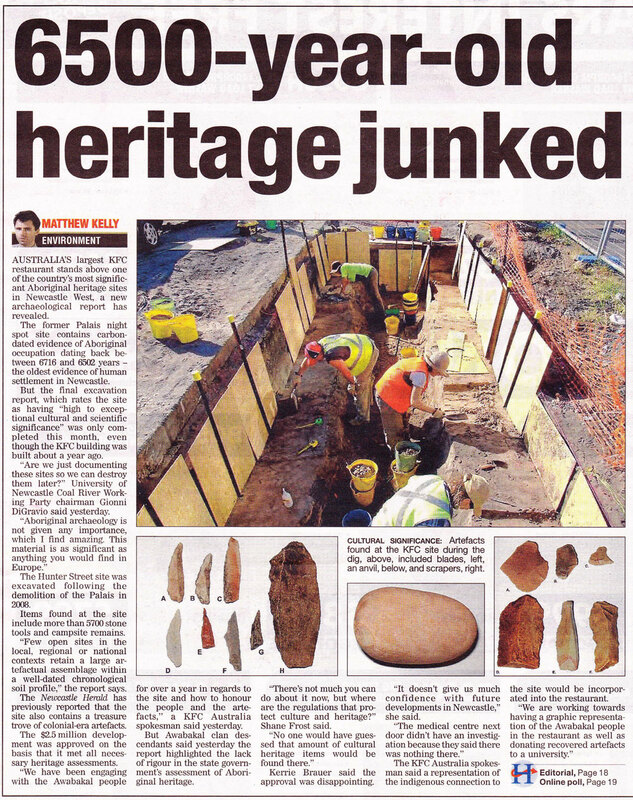 Contains interview with Julie Baird from the Newcastle Regional Museum and Gionni Di Gravio from the University of Newcastle’s Coal River Working Party who discuss the historical significance of the find, and what should happen to the artifacts recovered. 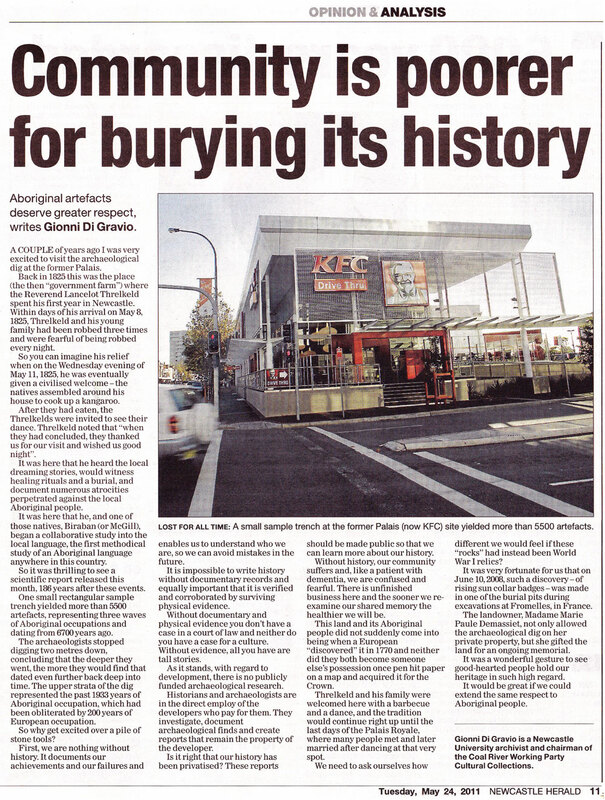 An Archaeological report which reveals one of Australia’s largest take-away restaurants was built on a significant Aboriginal site highlights a lack of respect for Aboriginal heritage, according to a university-based historical record-keeper. 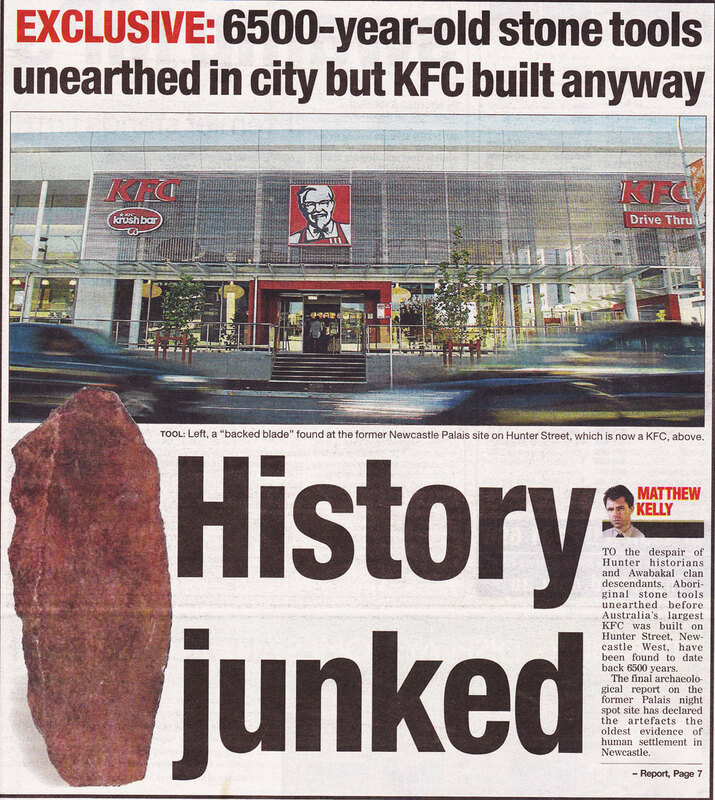 My father suggested the best possible spin on this: the KFC will probably be there for a century, keeping whatever’s left safe. Ahem. I would really have preferred they just allow more opportunity to find what’s there now. I, too, was hoping for that as well, unfortunately the building has completely destroyed the site.